President Donald Trump said Tuesday he is "100 percent" prepared to close down the US-Mexico border, warning Congress and Central American governments to take action to stem the flow of migrants into the country. Researchers from Stanford University have found much deeper connections between Chinese immigrants in the 19th century with the United States, a Stanford newsletter said Tuesday. Last week, after over two years of claims by Democrats and anti-Trump Republicans that the President was a Kremlin-controlled 'Manchurian candidate', special counsel Robert Mueller submitted his collusion probe to US Attorney General William Barr, who summarised that the probe found no evidence of collusion between Moscow and the Trump campaign. Democratic presidential candidate Bernie Sanders has raised 18.2 million U.S. dollars in the first quarter of 2019, which demonstrates stronger-than-ever support for the left-leaning politician. U.S. sanctions are cutting off Venezuela's access to vital medical supplies, including an 18-million-euro (20-million-U.S.-dollar) shipment of medicines and vaccines, Venezuela's Health Minister Carlos Alvarado said on Tuesday. US President Donald Trump held talks with NATO Secretary General Jens Stoltenberg at the White House on Tuesday, during which he continued urging his European allies to increase military expenditure. One of the four men suspected of kidnapping a Chinese national student in the Toronto area in Canada last month has turned himself in to police, York Regional Police said Tuesday. US President Donald Trump warned Tuesday he was "100 percent" ready to close the southern border if no deal is reached with Congress on immigration reform. Boeing must perform more work on a proposed fix to its 737 MAX aircraft before it can be submitted for review, US officials said Monday, suggesting the planes could stay grounded a while longer. Canada is experiencing warming at twice the rate of the rest of the world, with the effects most pronounced in the country's north, according to a new government report cited by local media. Some 25 White House officials including top advisers of President Donald Trump were given security clearances despite staff recommendations against it, a whistleblower has told Congress. The wife of Joaquin "El Chapo" Guzman is to launch a new line in clothing bearing the name of the jailed Mexican mob boss, convicted earlier this year of smuggling huge amounts of cocaine, heroin and methamphetamine into the US. Around 68 percent of the world's population is projected to live in urban areas by 2050, according to a UN report released on Monday. 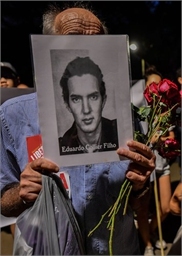 People holding pictures of people killed or missing during the 1964-85 dictatorship demonstrate on the 55th anniversary of the military coup, in Sao Paulo, Brazil, on Sunday. Further demonstrations are planned in other cities after President Jair Bolsonaro sparked anger by ordering the commemoration of the overthrow of president Joao Goulart. At least 20 people were killed and about 10 injured Sunday night in a bus fire at an illegal transport terminal in the Peruvian capital, emergency services said.